While scientists have known for some time that astronauts experience a slight height boost during a months-long stay on the International Space Station, NASA is only now starting to use ultrasound technology to see exactly what happens to astronauts' spines in microgravity as it occurs. "Today there is a new ultrasound device on the station that allows more precise musculoskeletal imaging required for assessment of the complex anatomy and the spine," the study's principal investigator Scott Dulchavsky said in a statement. 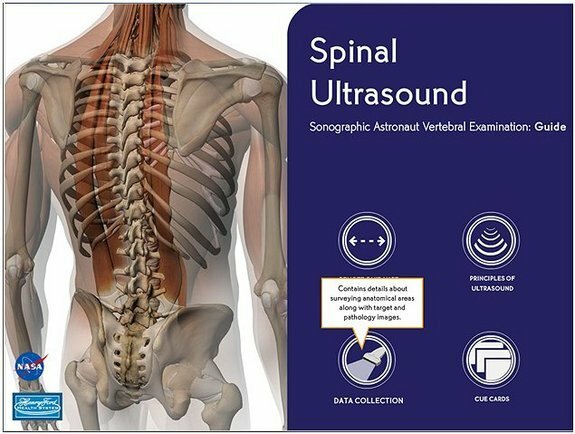 "The crew will be able to perform these complex evaluations in the next year due to a newly developed Just-In-Time training guide for spinal ultrasound, combined with refinements in crew training and remote guidance procedures." Past studies have shown that when the spine is not exposed to the pull of Earth's gravity, the vertebra can expand and relax, allowing astronauts to actually grow taller. That small gain is short lived, however. Once the astronauts return to Earth, their height returns to normal after a few months. But still, scientists haven't been able to examine the astronaut's spinal columns when experiencing the effects of microgravity until now. This month, astronauts will begin using the ultrasound device to scan each other's backs to see exactly what their spines look like after 30, 90 and 150 days in microgravity. Researchers will see the medical results in real time as the astronaut take turns scanning their spines of their crewmates. "Ultrasound also allows us to evaluate physiology in motion, such as the movement of muscles, blood in vessels, and function in other systems in the body," Dulchavsky said. "Physiological parameters derived from ultrasound and Doppler give instantaneous observations about the body non-invasively without radiation."